PrattPlus.com is happy to feature our line of packaging boxes made from 100% recycled paper in inventory with next day delivery to your door, direct from the mill. Made from 100% recycled materials, our performance-based packaging is the perfect solution to reducing paper weights without giving up performance characteristics. 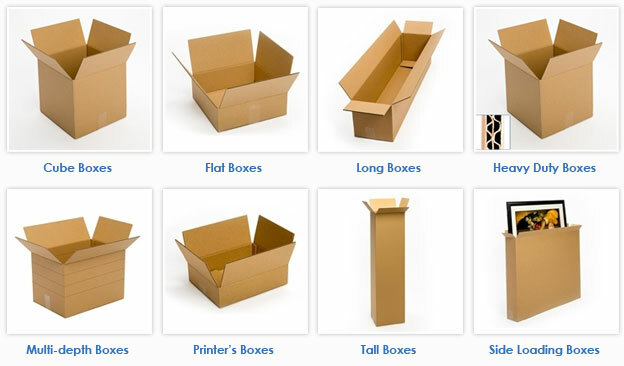 From cube boxes, flat boxes and long boxes to heavy duty boxes and multi-depth boxes, Pratt Plus offers a wide array of box sizes and options for your packaging needs. And, with the ability to search by box size, grade, flute and bundle quantity, you’re sure to find exactly what you’re looking for quickly and easily. Our extensive inventory of boxes is made available through Pratt Industries’ network of divisions consisting of recycling, paper mills, converting and corrugating. We “close the loop”, so that you can rest assure that you’re buying the most environmentally responsible packaging for your home or business. Waste Management: Packaging accounts for approximately one-third of the waste that gets sent to landfills. Pratt Industries Recycling Division works with communities and businesses across America to maximize landfill diversion. As a result of our efforts, nearly 2 million tons of waste paper are diverted each year. Recycling: We operate an extensive Recycling Division to supply the most modern container board system in North America with 100% recycled paper. Some items that cannot be recycled are used as fuel for Pratt’s clean energy plant which powers the paper-making process. The paper and corrugated products collected from our residential, community, school and commercial and industrial recycling programs are used as raw fiber for our three paper mills. 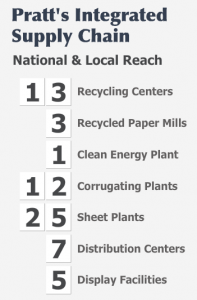 From Fiber to Paper: Pratt’s high-performance 100% recycled paper is manufactured at these mills which comprise the most technologically-advanced mill system in North America. Together, the paper mills and state-of-the-art corrugating facilities ensure that only the best raw materials are used to consistently produce good sheeting for our boxes. From Paper to Packaging: Our Converting Division takes sheets supplied from our 12 corrugating plants, and using the latest converting equipment, turns them into the industry’s best and most environmentally-friendly packaging. Closing the Loop: Pratt Industries packaging is proudly made from post-consumer recycled fiber and all lines are completely recyclable. 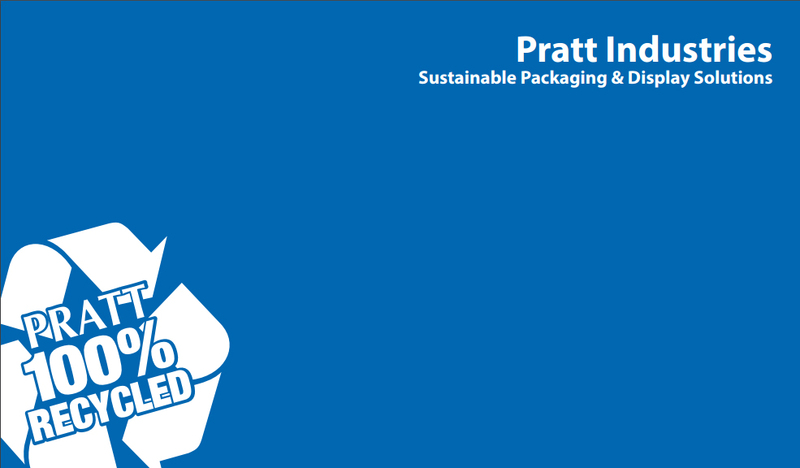 Many of our customers not only purchase the 100% recycled content packaging solutions from Pratt Industries but also recycle their waste paper and corrugated with our Recycling Division. These recyclable materials are then used as the raw materials for producing more recycled content packaging, as the loop begins again. Our close the loop recycling programs are not only cost effective, but also bring the social and public recognition for doing the right thing for our environment. As the 5th largest box manufacturer in the USA and the world’s largest, privately-held 100% recycled paper and packaging company, we offer superior packaging that is 100% environmentally friendly. 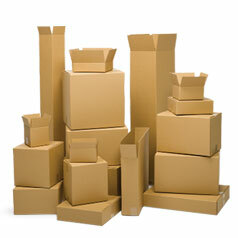 Shop PrattPlus.com for your 100% recycled boxes today!